Yesterday’s review sparked a good amount of healthy discussion about what should be allowed in a classroom and what fights are worth having to support your ideas in the classroom. I’m part of an amazing FB group that is filled with Comic Book Teachers. If you’d like to be added, let me know! Seriously, it’s teachers, librarians, and industry people geeking out about comics as educational tools, and it’s dope. Anyway, today, there will be no major controversy. I’m writing about a super-fun book about a super-cool dog! 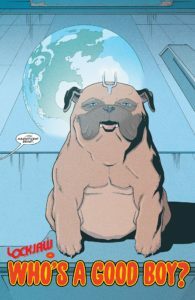 Let’s address the elephant in the room: it is not lost on me that a comic about a huge dog is written by a dude named Kibblesmith. 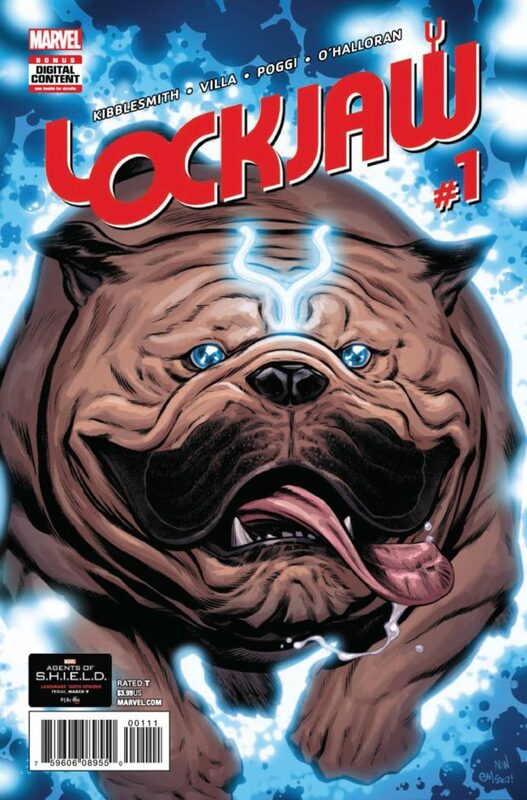 Now that that’s out of the way, what do we know about Lockjaw? Well, he is a companion to the Inhuman royal family, he can teleport across thousands of miles and dimensions, and he has what looks like a large tuning fork on his head. I do not know much about the Inhumans; I have read the Black Bolt trade, and I’ve read some of Ms. Marvel’s interactions with with them, including her stint with Lockjaw, but not much past that…so this is a good step toward learning more. This first issue slow plays the story in order to deliver some quality jokes. This series is not going to be serious. In the first issue we have a fun interaction with Karnak (whom I’ve also read a bit of), an intro to the comically sad life of Demolition Man, who is looking to be Lockjaw’s sidekick for the series, hamsters in spaceships attacking, and family reunion party-crashing mayhem! It’s going to be fun. I’m in for the journey, Kibblesmith knows how to write a joke, and art of Villa, Poggi, and O’Halloran is both controlled and exaggerated at the same time…sort of like Lockjaw himself. Dogs are in. 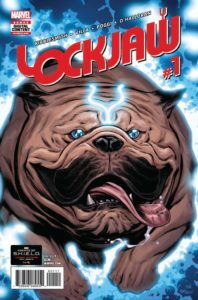 Lockjaw’s time is now! What’s a dog’s favorite part of the house? The roof.